Alphabet's s (GOOGL) autonomous driving "moonshot" could be a key driver of share growth in the long term. Shares of the Mountain View-based company were higher ahead of a fourth quarter earnings report to be released after today's market close. However, the positivity today could be a pittance compared to the company's Waymo self-driving effort. "We believe that while Search and digital ad dominance is what will carry shares in the near-to-midterm, longer term it is the company's artificial intelligence (AI) "moat" that will provide for new avenues of growth," the Action Alerts PLUS team noted. "AI is what has made the company's Search, Video (YouTube) and targeted ad capabilities best-in-class and is the driving force behind the company's success in voice (Google Home) and autonomous driving (Waymo)." The effort in Waymo is one that has certainly come into focus, as the long-term effort could add tens of billions to the company's already hefty valuation. "We revise our Waymo model for three emerging business models - ride sharing, logistics, licensing - and increase our enterprise value from $75 billion (ride sharing only) to $175 billion," Morgan Stanley analyst Brian Nowak wrote in a note late in 2018. "Waymo could address roughly 80% of the $3.1trln global freight transportation market and evolve into a logistics player for long-haul and last-mile delivery." The large valuation could certainly be justified, especially as Uber looks set to become the biggest IPO in history at a reported value of $120 billion for ride sharing alone. With the addition of logistics and supply chain services, the valuation should reasonably be expected to surpass Uber. This is especially so as self-driving cars are an inevitability according to Action Alerts PLUS analyst Zev Fima. "We ultimately came to the conclusion that while it will take time, we will all be riding around in autonomous vehicles eventually," he wrote in a white paper on the subject. "It may start with those who need it at first, perhaps because they are simply more willing to take the risk of being first in exchange for increased independence. But in time, we believe that everyone will find a reason to own one." The concerns reported in Gallup polls on consumer trust of self-driving cars could also be assuaged soon enough, accelerating the timeline expected by Fima. Reports submitted to the California Department of Motor Vehicles by self-driving vehicle manufacturers during 2017 indicate that autonomous vehicles often require "disengagements," or a need for a human driver take over from automated systems. According to the report, Waymo had the lowest disengagement rate, touting 63 interventions over 352,545 miles, or one per 5,600 miles. By comparison, GM's (GM) Cruise had over 100 disengagements despite traveling only 131,675.9 miles, or about 37% of the miles traveled by Google's vehicles. 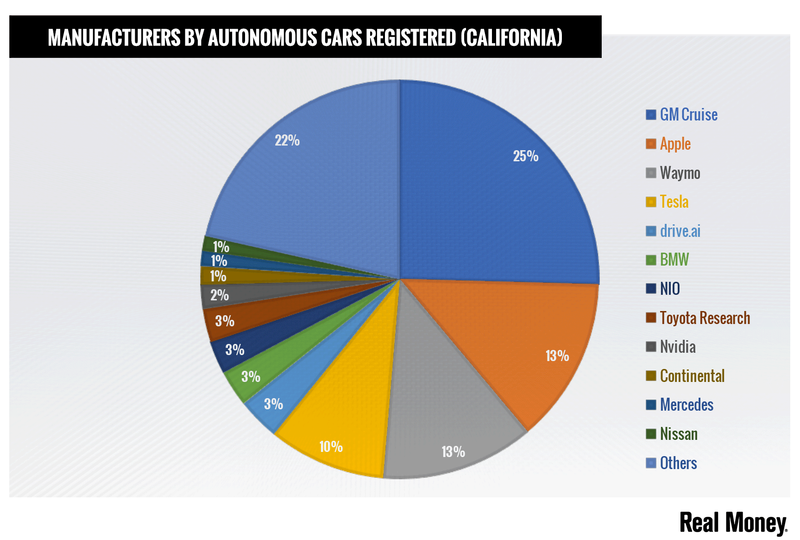 If Waymo can maintain its lead in reliability and safety, it will be able to maintain a lead in consumer, and regulator, trust. Given the early stages of the effort, the opportunity offered by Waymo has largely been left out of Alphabet's valuation. That could prove a key buying thesis for those bullish on autonomous driving. "It is still early overall for Waymo but continued emphasis on operations and deployment, along with the planned launch of the ride-hailing program in Arizona in 2018, puts it on a clearer path to monetization," JP Morgan analyst Doug Anmuth said. "We believe the value of Waymo is underrepresented in Alphabet's current share price." Comments on the program will certainly be key for longer term investors as CEO Sundar Pichai and CFO Ruth Porat outline Alphabet's outlook this evening. Tonight's call is expected to follow an earnings release after market-close and will be available for streaming here.